fennel is a real favourite of mine – whether it be the fresh vegetable, which i am as happy to eat raw or cooked, or fennel seeds which i use to spice many different types of dishes – and it works particularly well with pork, especially sausages. 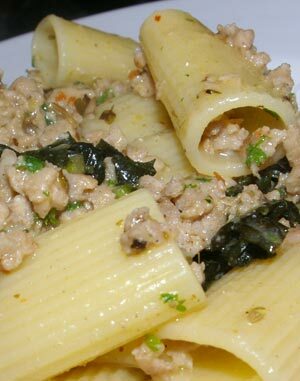 sausage and fennel is a classic combination for pasta dishes and i’m enjoying trying different variations. first it was angela hartnett’s orecchiette con salsiccia, finocchio e prezzemolo, next it’s going to be gordon ramsay’s sausage, fennel seed and tomato pappardelle, but this week i tried jamie oliver’s proper blokes' sausage fusilli. this recipe is very different from angela hartnett’s dish which contains a lot of tomatoes which make a rich sauce. in jamie’s recipe there isn’t much of a sauce, just the juices which form as the sausages cook in a small amount of white wine. the flavour kick comes from the combination of fennel seeds, dried chillies and lemon zest plus the herbiness of oregano and parsley. this is a really delicious dish and i like the cleanness of the taste. i added shredded cavolo nero and i think this really adds to the flavours and, of course, provides some much-needed vegetable content. this is my contribution to this week’s presto pasta nights which is being hosted by a fellow african in the vanielje kitchen. this is a real blokey, gutsy yet simple pasta dish – but saying that, girls tend to like it as well! it hasn’t really got a sauce of any description because all the flavour that comes out of the ingredients will stick to the pasta and that’s enough. i will even go so far as to say that this is one of my top ten pasta dishes! remember to buy the best sausages you can afford – if you get cheap, dodgy sausages it just won’t work. bash up the fennel seeds and chillies in a pestle and mortar or flavour shaker until coarsely crushed, then put to one side. heat a splash of olive oil in a heavy-bottomed frying pan. squeeze the meat out of the sausage skins and put into the pan, really breaking it up using the back of a spoon. fry for a few minutes until the meat starts to colour and the fat has rendered slightly, then crush it once more so it resembles coarse mince. add the bashed-up fennel seeds and chillies and cook on a medium heat for around 10 minutes until the meat becomes crisp, golden brown and slightly caramelized. stir in your oregano, then pour in the white wine and allow it to reduce by half. add the lemon zest and juice. turn the heat down to low while you cook your pasta in a large pan of salted boiling water according to the packet instructions. when the pasta has cooked al dente, drain it in a colander, reserving some of the cooking water, and toss it in the pan with your sausage meat. coat the pasta in all the lovely flavours then add the butter, parmesan, chopped parsley and a few spoonfuls of the reserved cooking water. this will give you a lovely loose, shiny sauce. taste and check for seasoning, then serve immediately with a little extra grated parmesan sprinkled over the top. abby’s variation: shred a couple of handfuls of cavolo nero or savoy cabbage and boil briefly in the water you will cook your pasta in. add this to the sausages just before you add the herbs and wine.